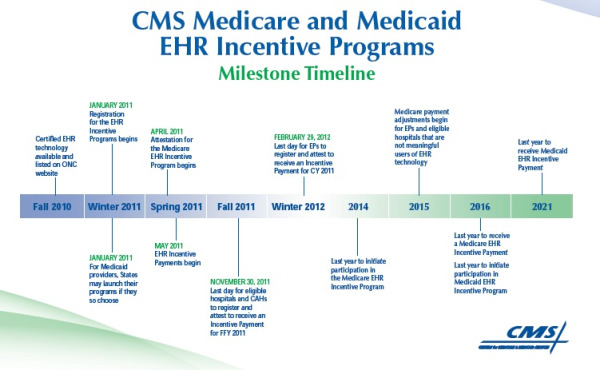 The Medicaid EHR incentive program will provide incentive payments to eligible professionals and eligible hospitals as they adopt, implement, upgrade, or demonstrate meaningful use of certified EHR technology in their first year of participation and demonstrate meaningful use for up to 5 remaining participation years. Medicaid EHR incentive programs are voluntarily offered by individual states and territories and may begin in 2011. Eligible professionals can receive up to $63,750 over the 6 years that they choose to participate in the program. Eligible hospital incentive payments may begin as early as 2011, depending when the state begins its program. 2016 is the last year a Medicaid eligible hospital may begin the program and the hospital payments are based on a number of factors, beginning with a $2 million base payment. For physicians, nurse practitioners, and nurse midwives in private practice, the Medicaid threshold is 30 percent of patients. Pediatricians seeing more than 20 percent Medicaid patients but less than the 30 percent of the threshold could receive a reduced incentive payment. For physicians, nurse practitioners, nurse midwives, and physician assistants working in either rural health clinics or federally qualified health centers, the threshold is also 30 percent; however, they can include SCHIP enrollees, patients for whom no payment is made to the clinic for their care, or patients to whom a sliding fee scale is applied. Medicaid Incentive payments are set up to help offset some or all of the actual initial costs of a Certified EHR system plus, additional annual payments for support. Our consulting services do not cost you anything. So why not contact us today for a FREE DEMO of an EMR for your specific specialty by simply completing our FREE Demonstration Form. You have nothing to lose, and everything to gain! Free EMR is not a myth. When you bundle our other services with an EMR, you will be able to tell your other colleagues about your latest ‘Free EMR’.